Luv's unusual design combines Nordic purism and timeless elegance. Gentle forms follow a sharp geometry. Three sizes of oval above-counter basins made from DuraCeram® impress with their subtle lines, generous inner basins and clean edges. On the variants with an incorporated tap-hole platform, the tap fitting is mounted centrally at the rear, and on the small handrinse basins it is fitted on the left or right side. The optionally glazed exterior is available in satin matt White, Grey or Sand. This contrast with the glossy white glazed inner basin produces unique pieces with a special look and feel. The ceramic drain cover completes the harmonious look. The washbasin stand consists of a console table on four gently curved, height-adjustable feet.Three widths are available: 1788 mm for the double washbasin, 1388 mm for the single and 688 mm for the guest bathroom. Lacquered in satin matt and available in White, Nordic White, Taupe, Stone Grey, Light Blue and Night Blue, the console tables contribute significantly to the feeling of space. Quartz console panels in three perfectly harmonized colour variants and a solid-wood version in American walnut can be combined as desired by the customer. Storage space is available in the form of handle-free pull-out compartments and drawers, conveniently fitted with tip-on technology and self-closing mechanisms. The series is completed by new mirrors in three widths ranging from 500 to 1600 mm with an integrated dimming function and mirror heating. In addition to the standard mirror height of 800 mm, all models are also available in a height of 1200 mm. 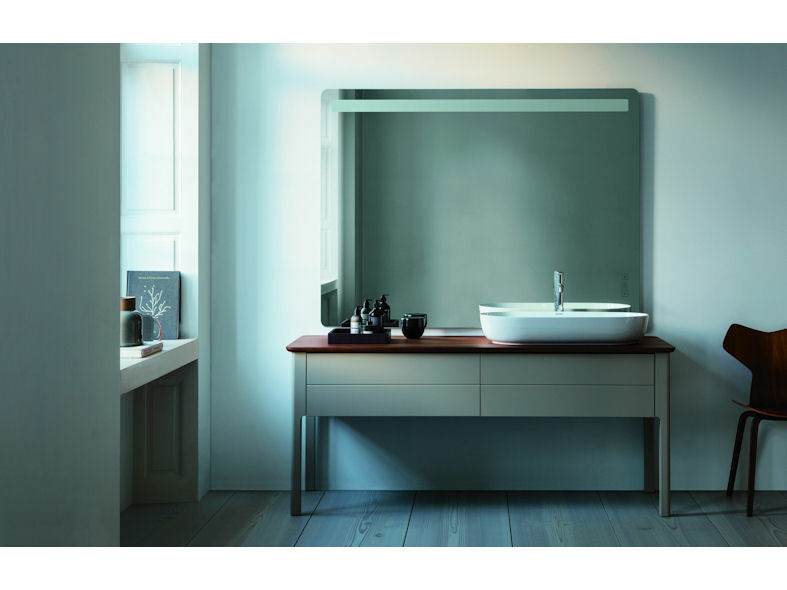 The glare-free LED lighting at the top edge of the mirror with activated ambient lighting guarantees optimum illumination of up to 700 lux. 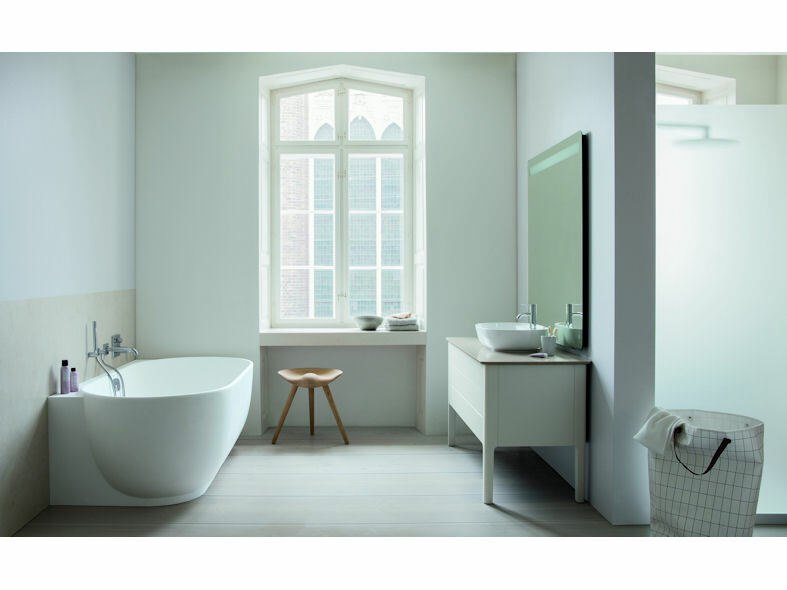 Luv also offers no-nonsense bathtubs that are based on the shape of the wash bowls. Seamless, and made from DuraSolid A, they offer a pleasantly warm feel and high-quality matt look. They are available in free-standing, back-to-wall and corner (left or right) versions. As a special extra, the bathtub can be equipped with a discreetly integrated air whirl system (exclusive to the back-to-wall and corner version), or with an integrated sound system which can be operated using any Bluetooth-compatible device.